The Marshall Milton Keynes AC under 15 track and field team comprising almost 50 athletes finished a very creditable second in the Midlands Premier League. Competing at Nottingham they were second again to defending champions, Rugby and Northampton and ahead of Charnwood AC, Birchfield Harriers, Nottingham and Stoke. At this half-way stage MMKAC are placed 2nd in the league from the six clubs and well on their way to establishing themselves in the Premier League. Two club records were set. The under 13 girls 4 x100m relay team of Charlotte Underwood, Lateefa. Agberemi, Moyin Oduyemi & Asher Cliff-Afemari clocked 54.9 to clip the time of 55.6 set in 2000. Harrison Read improved the under 15boys 300m record with a time of 39.0 taking 2-seconds of the time set by Archie Rippon in 2012. This latter age group were the most successful on the day as Ethan Wiltshire won the 100m(12.2) and then a double in the 800m from James Dowsett(2.11.6) and Brian Sayle(2.13.4). In the field, James Ericsson-Nichols won the hammer(41.82m) and placed 2nd in the discus(29.14m). James Palmer and Sam Featherstone put together a shot double, 9.89m and 7.66m respectively and then Sam won the “A” high jump with 1m68, 7th best in the club all-time rankings, with Ben Stacey clearing 1.60m for a “B” string victory. For the under 15 girls Charlotte Bailey was back to her near best winning the high jump (1.53m). Hannah Weatherley threw the javelin 27.04m just off her PB for 2nd position whilst Tamzin Hill placed 3rd in both shot(7.72m) and “B” high jump(1.30m). Gurveer Kaur Khera took two 2nd “B” string placings, discus(17.00m) and hammer(20.62m). In some very competitive track races personal bests and 3rd places from both Montana Edghill, 800m(2.34.5) and Barbara de Koning in the1500m(5.02.6). Adelowo(13.9). This duo teamed up with Thomas Chalmers and Chad Wilson to win the 4x100m relay in 54.3, not too far off the club record. Yinka placed 3rd in the 75m hurdles(13.3) with Rhys Jordan 2nd “B” string(15.2). Rhys long jumped 4.32m for 2nd place with Tim Penley 2nd in the “B”(4.08m). Tim had earlier placed 2nd in the shot(7.00m). In the middle distance races “B” string 2nd places for Seb Henry(800m/2.34.1) and Aidan Murphy(1500m/5.06.6). Finally in the under13 girls events there was an excellent sprint double and personal bests from Moyin Oduyemi(75m/10.4) and 150m with 20.1. The latter the 2nd best in the all-time rankings. For good measure Moyin won the “B” shot(6.54m). Lateefah Agberemi won the “B” 75m(10.6). Charlotte Underwood placed 2nd in the 1200m(4.04.2) and won the “B” 70m hurdles(12.3). In the throws there was a win for Lara Moffat in the “A” shot(8.55m) and a 2nd place in the javelin from Eve Durand(21.55m). Elsewhere, Sophie Gibbens has taken to fell running and put in a very good performance in the annual Cader Idris mountain race in North Wales. The course was 16km in length with a climb up and down of 900m. Sophie placed 7th lady finishing well in the top half of the field, 106th overall from 234 finishers. John Skelton who has accumulated numerous M60 club road records in recent years, moved up to the M65’s recently and at the Worcester Half-Marathon clocked 89.22 to take almost 4mins off the previous record. 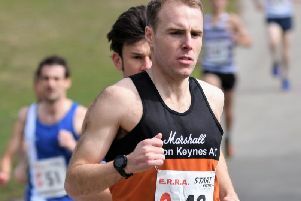 Dan Webber led home 15 MK runners in the annual Blisworth 5miles race, 23rd in 29.24. Kelvin Smith placed 2nd M65(37.15) and Deborah Hindmarch won the F60 prize(38.14).